Lunch in a Box has moved to www.lunchinabox.net All LJ content and comments have been exported there; come join us and check out the Top Speed Tips page! I like to keep a knob of ginger on hand, but I often don't use it all up before it starts to shrivel up and lose its potency. Last week a friend gave me a whole bag of ginger and I knew there was no way I could use it in time, so I consulted the Japanese books on freezing and found that ginger can be frozen both sliced and grated. 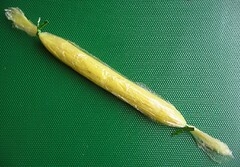 An ingenious way to store grated ginger is to form it into a long, skinny cylinder in plastic wrap, and freeze it. When you're ready to use some, just break or cut off as much as you need and return the rest to the freezer! Convenient for adding quick flavor to a dish that you're cooking for a speedy lunch or dinner. 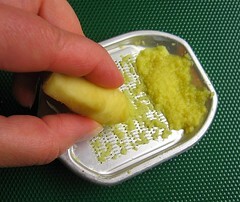 I have a couple of special ginger graters, but a Microplane rasp-type grater also does an okay job. Ceramic ginger graters (like this and this ) and metal ones below do produce a nicer, silkier product without the fibrous strings, and collect the juice in a little reservoir in the grater. Worthwhile if you grate a lot of ginger, otherwise don't sweat it. You can also freeze pre-sliced (or julienned) ginger. Just peel and slice, wrap tightly in plastic wrap, and freeze in another container (freezer bag or plastic container like tiny Tupperware) to prevent freezer burn. 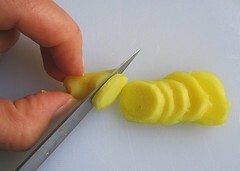 Tip on peeling ginger: use the edge of a spoon to quickly and easily scrape off the thin peel without wasting ginger. A big thanks to everyone who helped me move onto the top page in the Blogger's Choice Awards! Lunch in a Box is nominated for Best Food Blog, and is currently #9 out of 283 food blogs. If you'd like to vote, click here (you can vote for for multiple blogs in the same category). I'm now only 14 votes away from the #8 slot -- we've broken into the vegan voter territory! Excellent timing on your part! I just had some ginger that despite Press'N Seal and refrigeration, had started to go ew-yuck on me. This will work nicely. Two important descriptives, 'un-Martha' and 'Alton-like'. ;) Every time I think about that sesame-toasting pan, Alton pulls me up short ('uni-tasker!'). I strive for Alton-like multitasking in my kitchen equipment, but the Japanese dollar stores are my weakness... I got my sesame-toasting pan for 100 yen a decade ago, but I wouldn't pay a lot for one. You could always jury-rig one with a regular frying pan and a splatter screen. I think Alton would approve!!! That's CostPlus, right? Good tip (as long as the price is right)! BTW, I just added the jury-rig idea to the description of the sesame toasting pan in my store -- McGuyering your own tools can be just as much fun as acquiring new kitchen gadgets! Yup - they kinda run the names together, apparently. We just got a big one built near work not long ago. Their pan, according to their website, is $14, same as Amazon's. I think. The only cheaper I've seen has been Bento Obento's $10 one, but there's the question of how sturdy a handle. BTW, I remember you mentioning a pan you stopped using because the handle got too hot. I found this 'hot handle mitt' critter at the heavenly Lodge Manufacturing Outlet Store, and it's been great. I use it on the cast iron and my Visions glass cookware, and it holds the spatter-screen in position when you slide its handle into the mitt as well. Oh, I know where Bento Obento (BentoTV) sourced that $10 pan from -- it was either $1 or $1.50 at Ichiban Kan in San Francisco's Japantown. It's very small and not very good quality, but I don't mind for $1.50 (I've got that tiny one for two eggs and a better-quality larger one for four eggs, but not the really huge square one). I've got similar hot handle covers in silicone and leather, but I just gave up on the ridiculous tiny pan -- bad balance (pan wouldn't stay balanced on the burner), and the very short handle made it hard to use the handle covers. More trouble than it was worth, plus Bug and his friends like to play with it! Better toy than pan. She does have some... creative... markups, doesn't she. Ya pay for convenience. I'll check out the World Market one next week and give you a review. I generally cut my ginger into 1" chunks (standard amount for most Indian-style dishes I make) and freeze the chunks. I find it's easier to work with (chopping, grating, etc) the frozen chunks than the fresh ginger. I do the exact same thing. It works perfectly especially because it's easier to peel and grate when still frozen! I think I'll do all of them so that I have all kinds on hand -- big chunks, slices, julienne sticks, and grated. I still have about half of the big bag from my friend left. I like the frozen grated ginger because where I'd been using the ginger in a tube (S&B stuff, like the wasabi in a tube) in a pinch, it's got extraneous ingredients in it -- not just ginger. I'm all for short ingredient lists. Actually, it looks quite simple! I checked it out in the The Joy of Pickling by Linda Ziedrich -- looks like young ginger is better suited to this than the mature ginger that I have, though. Someone else has reprinted the recipe here (hopefully with permission): http://www.fabulousfoods.com/recipes/appetizers/pickles/jappickginger.html I picked up this book at an organic winery in Sonoma Valley (Preston) to get into pickling (pickling recipes from all over the world), but I haven't yet taken the plunge. Ooh, I don't have a green thumb -- perhaps someone else can chime in on this? I just freeze the whole ginger hand and grate it frozen as needed. 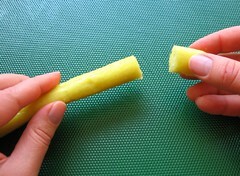 It's really easy to grate frozen, and the skin comes off as you grate so you don't need to peel. Thanks! I'll add that to the repertoire so I have all kinds of ginger on hand -- whole, big chunks, slices, julienne sticks, and grated. I still have about half of the big bag from my friend left and I'm feeling lazy. My pleasure steamy! Beautiful and interesting blog, by the way -- truly inspirational! Ooh, very cool! People coming over from Well Fed might also be interested in this tip: Using refrigerator magnets to track freezer inventory SlashFood picked it up last month. I voted for your blog yesterday. I am learning a lot from your tips and look forward to reading it everyday. You can do the same for garlic. Just mince the garlic and store them in a ziplock bag or plastic wrap, and store in freezer. I have a tuppleware in the freezer to store all these frozen condiments wrapped in plastic wrap. Take a tiny amount out every time you need to use it. Right you are! The freezing books say that it can also be frozen whole, sliced, chopped or grated, with different freezing tips for the different forms. I should probably do a post on that -- sounds convenient. While i very much like your frozen 'tube of grated ginger' invention (I do this w/tomato paste)I wonder if the strength of the ginger is significantly diminished w/ the breaking down of the product? I freeze well wrapped knobs of ginger, then I remove and ,if necessary, cut the size piece I need. While it's frozen, the ginger skin easily scrapes off with a serated knife. After a few minutes, the knob softens enough to slice etc.